This tutorial gives some hints to boost your visual servo control law in order to speed up the time to convergence. 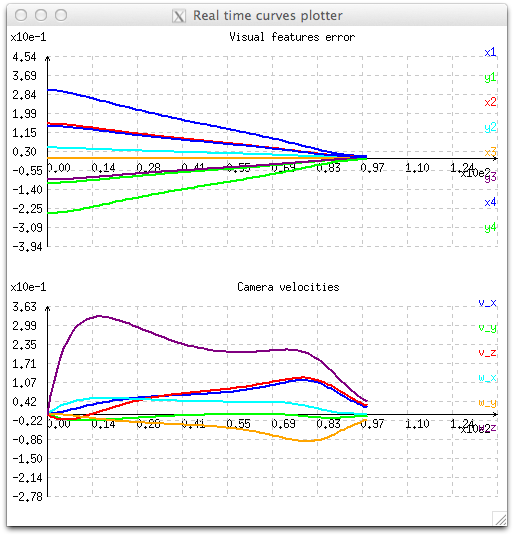 To illustrate this tutorial let us consider the example tutorial-ibvs-4pts-plotter.cpp introduced in Tutorial: Image-based visual servo. This example consider an image based visual servoing using four points as visual features. In the general case, considering as the input velocities to the robot controller, the control laws provided in vpServo class lead to the following control law where the sign is negative for an eye in hand servo and positive for an eye to hand servo, is a constant gain, is the task Jacobian and is the error to regulate to zero. As described in , this control law ensure an exponential decoupled decrease of the error . This behavior is illustrated with the next figure, where we see the exponential decrease of the eight visual features (x and y for each point) and the corresponding six velocities that are applied to the robot controller. As a consequence, velocities are high when the error is important, and very low when the error is small near the convergence. At the beginning, we can also notice velocity discontinuities with velocities varying from zero to high values in one iteration. Convergence in 191 iterations with a constant gain. is the infinity norm of the task Jacobian to consider. The impact of the adaptive gain is illustrated in the next figure. 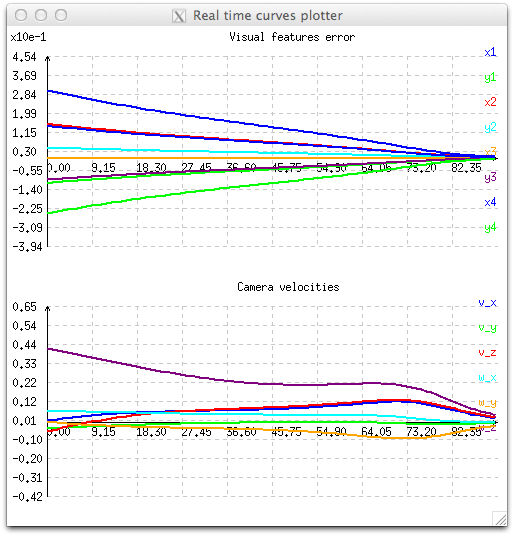 During the servo, velocities applied to the controller are higher, especially when the visual error is small. But as in the previous section, using an adaptive gain doesn't insure continuous velocities especially at the first iteration. Convergence in 91 iterations with an adaptive gain. 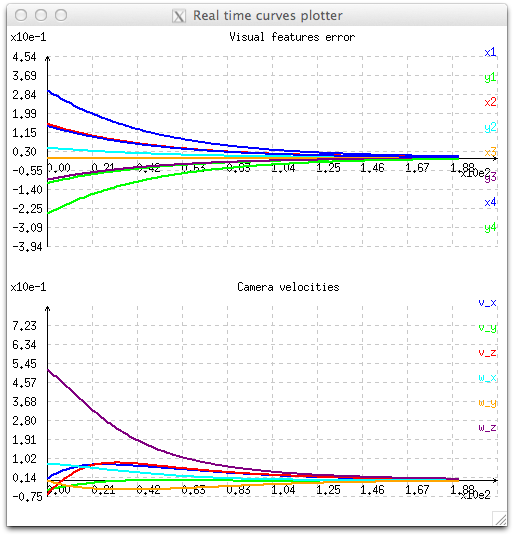 As implemented in tutorial-ibvs-4pts-plotter-continuous-gain-adaptive.cpp it is also possible to ensure continuous sequencing to avoid velocity discontinuities. This behavior is achieved by introducing an additional term to the general form of the control law. This additional term comes from the task sequencing approach described in  equation (17). It allows to compute continuous velocities by avoiding abrupt changes in the command. is the resulting continuous velocity command to apply to the robot controller. is the Jacobian of the task. is a gain. We recommend to set this value to 4.
is the value of when . The effect of continuous sequencing is illustrated in the next figure where during the first iterations velocities are starting from zero. Convergence in 98 iterations with an adaptive gain and continuous sequencing. You are now ready to see the Tutorial: PBVS with Panda 7-dof robot from Franka Emika that will show how to use adaptive gain and task sequencing on a real robot.